November 23, 2016 – 7:30 pm * Tickets (incl. 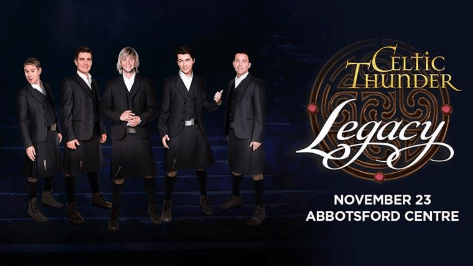 GST) $65.00, $75.00 (Plus FMF & Service Charges) Storming onto the main stage are international megastars Celtic Thunder, with LEGACY, a brand new show that celebrates the influence of Irish and Celtic music around the world. LEGACY is a live show featuring a mix of lively, fast paced and upbeat songs “A Place in The Choir” “Galway Girl” and “Raggle Taggle Gypsy” that represent the fun loving nature of the Irish and slower classic ballads “Danny Boy” “Noreen” and “Buachaille On Eirne” that portray a more nostalgic and romantic side. Celtic Thunder features five male vocalists backed by the amazing 8-piece Celtic Thunder band, ensuring that Celtic Thunder LEGACY has something special something to offer to everyone. © 2017 - Best Western Regency - Abbotsford - BC, Canada. Each Best Western® branded hotel is independently owned and operated.